Bridge Substructure Elements Surveyed with GPR to Map Rebar Placement at Midway Airport in Chicago, Illinois - Infrasense Inc.
Infrasense completed a ground penetrating radar (GPR) survey to map the size and position of the steel reinforcing mesh within an undocumented pier extension at the Midway Airport in Chicago, Illinois. The pier itself was originally designed as a three-column structure, but was constructed as a four-column structure without updated as-built information being recorded. 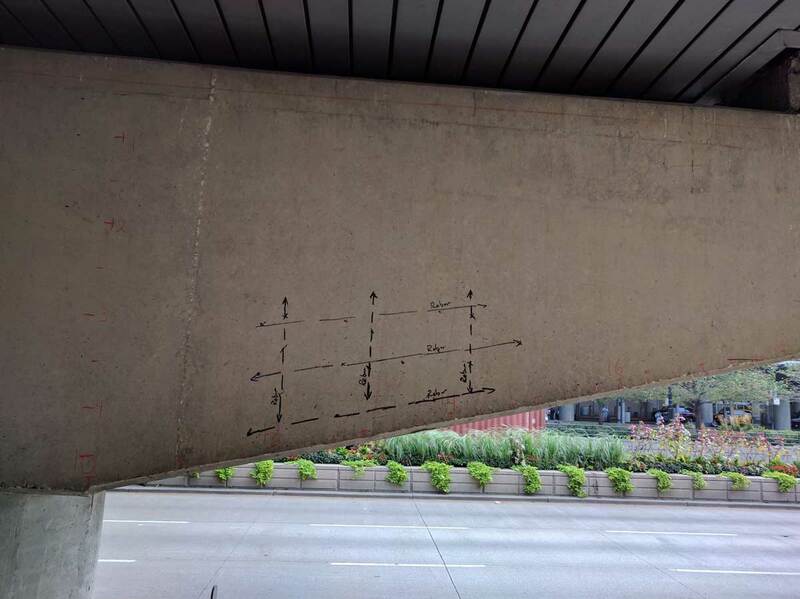 Concerns over the structural effectiveness were raised, and GPR was brought in to identify the reinforcing steel pattern, determine the rebar thickness, and identify the depth of the caisson supporting the fourth column. 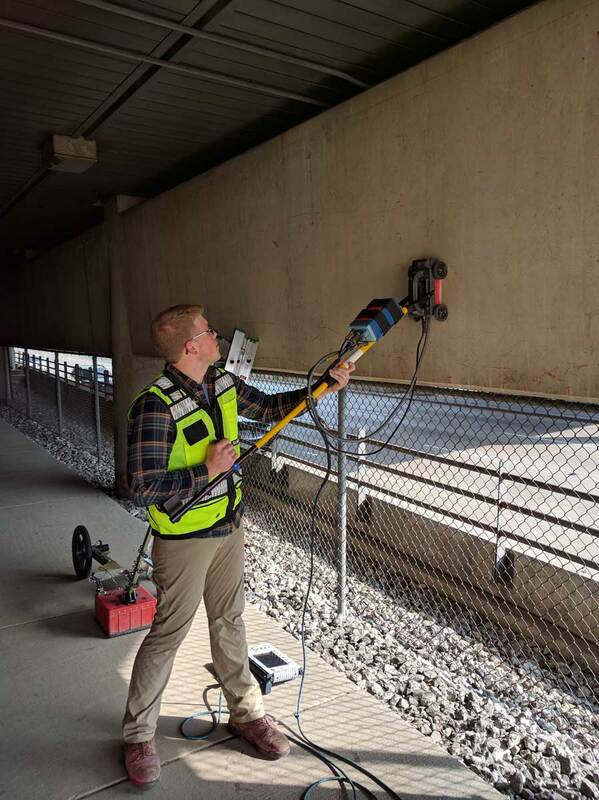 GPR was the preferred method for this survey because of its ability to accurately measure the location and depth of objects within a material (concrete) without the need for cutting, drilling, or coring. The method is readily mobilized and provides real time information that can be used by the client for immediate verification and scope of work changes. To identify the rebar construction a 1.5-GHz GSSI GPR antenna was used to collect a series of bi-directional lines spaced at 4-inches apart in the vertical direction and 6-inches apart in the horizontal direction. The GPR survey covered four sides of the concrete pier. A 400-MHz antenna was used to map the depth of the caisson by collecting parallel lines surrounding the pier column. The data collection was completed in approximately 4-hours, using equipment that was hand carried to the project area.